What’s the big deal with fantasy sports? I’m a guy and I love sports, but I can never get excited about a fantasy league. The draft is a hassle to set up, and even when everyone agrees on a date, teams still end up auto drafting because someone was a no-show. And the draft is the best part. After that, the engagement with fantasy sports is limited to setting a roster or bribing your friend for a lopsided trade. It falls short of the interaction that most sports fans and fantasy sports players desire. Don’t get me wrong. If you can find a good league, fantasy sports can be fun and a good way for friends or coworkers to have some carefree competition. However, for some, fantasy sports do not offer enough involvement, action, and engagement. Fanamana (which is fun to type and say) is for sports fans who want a different and more interactive fantasy sports option. Fanamana is the first mobile live-action fantasy sports game. Instead of passively watching the games and hoping the lineup you set earlier performs well enough to win, Fanamana utilizes live game action to construct live head-to-head games. 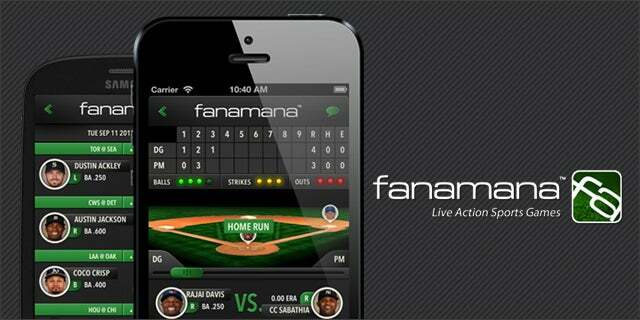 With Fanamana’s first sport offering, baseball, there are no set leagues, drafts, or lineup selections. Instead, users can play head-to-head with a friend or any other Fanamana user. Plugging into live game data, users take turn at-bat in a nine-inning game, just like the real thing. When it is your turn to bat, you choose from the list of MLB batters on-deck in real life. If he gets a hit, you get a hit; if he strikes out, you strike out. This allows users to constantly engage in live MLB action through the mobile application. Check out this walk-through demo of how the game works for both the user at-bat and the user in the field. Fanamana includes up-to-date player statistics and chat capability so users can trash talk their opponent in the game interface. All of this leads to increased involvement and better interactivity for fantasy sports enthusiasts. What traditional fantasy sports experiences lack, Fanamana focuses on. Finally, sports fans who crave a higher level of excitement and engagement from their fantasy sports have an mobile application that meets their needs. Fanamana was a showcased startup for our Tech Cocktail DC mixer. We speak to Kurt Glazemakers, a CTO at security company Cyxetra, about the way it is completely transforming network security to help protect companies and keep our data safe.